Golub was seminal in the Chicago Figurative Expressionist movement which was largely influenced by a strong reaction against the New York bohemian art establishment. His powerful and often grotesque canvases remain as potent today as they did in his heyday. Golub was a political painter in the truest sense. His work was largely influenced by the existential aftermath of World War II, and would continue to express the horrors of war and political games. Along with his wife, Nancy Spero, they were the most outspoken anti-war artists of their era. Golub’s disfigured images of human flesh, mangled and charred, present a dark emotional and psychological interrogation of the human condition. They symbolized a loss of self and dignity after the deadliest war in modern history. These paintings draw connections to those soldiers who returned from battle, scarred for life, in both the emotional and physical sense. During the 1960s, Golub took on the Vietnam war with powerful mural sized anti-war paintings. In the late 1970s, Golub painted an enormous group of portraits (well over one hundred) of public figures including dictators, religious figures, and politicians. Beginning in the 1980s, he exposed the terror and oppression of authoritative figures and governments on their victims in his renowned Mercenaries series of paintings. The current exhibition in London features a strong selection of these paintings (seen above is Mercenaries IV from 1980), which overall imbue a sense of hopelessness and senselessness amongst humanity at the hands of barbarism and corruption of institutional power. Joan Brown was one of the major West-Coast artists to prominently paint figurative and representational imagery during the mid-1950s. 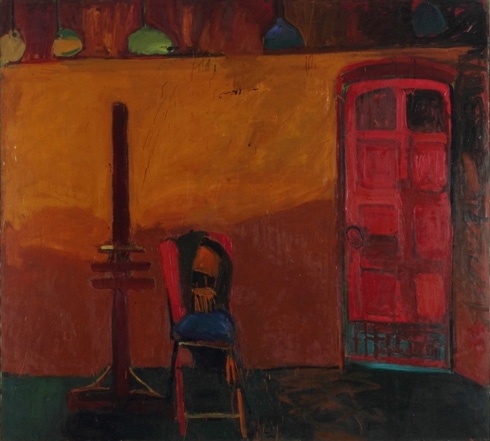 She debuted amongst Bay Area painters such as David Park, Elmer Bischoff, and Richard Diebenkorn. In her short life (she died at 52), Brown was a prolific painter. Her work is largely autobiographical, drawing on personal, and later spiritual themes. In 1975 Brown nearly drowned when she and a group were hit with the wake of a passing freighter on a swim from San Francisco bay to the Island of Alcatraz. This event inspired a series of paintings, and water has been a major motif in Brown’s oeuvre. Brown painted her figures to scale, which invite the viewer to participate in their painterly world. The paintings hanging in George Adams Gallery present a diverse oeuvre. Brown was constantly going in new directions with her painting, however, the essence of these figurative works always remained rooted in the human experience. There will be more to come on both the Chicago Figurative Expressionists and the Bay Area Figurative Expressionists in (near) future posts. Bite Your Tongue is up through May 17th, and Joan Brown: Selected Major Paintings and Sculptures 1957-1975 will be up until May 30.